When orcas and white sharks cross paths, only one can prevail as the true apex predator. New research from the Monterey Bay Aquarium published in Nature Scientific Reports details these rare, sometimes brutal encounters — and their ecological implications. Daniel Potter, Monterey Bay Aquarium. It’s a study decades in the making because observations of the two creatures interacting is a rarity. Scot Anderson, a white shark expert and seasonal researcher for the Aquarium, still remembers one such run-in more than 20 years ago near the Farallon Islands, a short boat ride west of downtown San Francisco. The first scorecard came on October 4, 1997, when orcas killed and partially ate a white shark within view of a whale-watching boat. Scot was heading out from nearby Bolinas when he heard what was happening over the radio. That was apparently all it took to drive off white sharks for the rest of the season. Scot scoured the area for nearly two weeks afterward and saw zero. Orcas don’t hunt at the Farallones every year, but white sharks do. The federally protected islands represent a small but concentrated colony of elephant seals — important white shark prey sometimes also targeted by transient pods of orcas. Interactions between white sharks and orcas are rare, but documented cases have occurred at the Farallon Islands off the coast of San Francisco (above), and in South Africa. 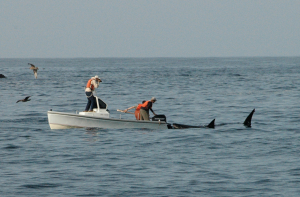 One November afternoon in 2009, 17 tagged sharks were detected around the Farallones when two pods of orcas showed up. Observers saw the orcas feasting on seals, and while all the tagged sharks survived, others without tags may have been picked off. Seasonal aggregations of elephant seals attract white sharks — and sometimes orcas — off the coast of California. 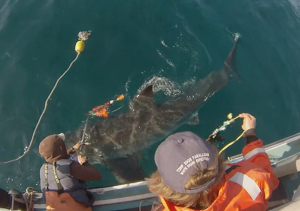 The orcas departed just a few hours later, but the tagged white sharks were spooked. By nightfall, all 17 had left the Farallones. 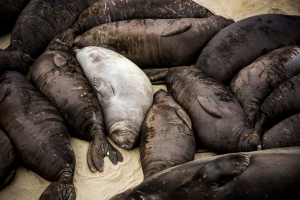 Many showed up soon after around Tomales Point to the north or Año Nuevo Island to the south, two other elephant seal rookeries frequented by white sharks. “You can really only have one apex,” says Scot, who coauthored the paper alongside Sal and several others. “There’s only one top-top.” White sharks, Scot argues, are outclassed by bigger, smarter animals in orcas, which can communicate and hunt strategically in groups. 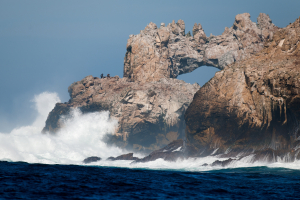 Since the 2009 encounter, the team combined tagging data with long-term seal and shark surveys conducted by collaborators at Point Blue Conservation Science and revealed similar run-ins at the Farallones in 2011 and 2013. The same pattern has also been reported in Australia and South Africa. After a pod of orcas scares off the white sharks for the season, the survey data show that elephant seals in the area benefit, Sal says. And that benefit could last for many months. Meanwhile, the white sharks that flee must compete for food elsewhere, which may undermine their fitness, since they need to build substantial energy reserves to fuel their long ocean migrations. Working with partners, Aquarium researchers compared white shark tagging data to wildlife surveys conducted over decades to illustrate white shark and orca interactions. 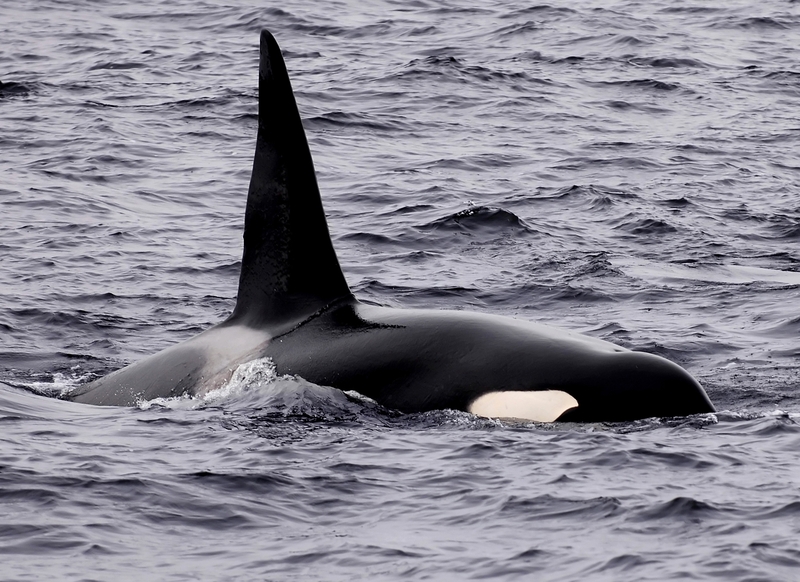 While it remains unclear whether orcas deliberately prey upon white sharks, Sal says, “I think this shows that food chains are not always linear.” In the hierarchy of ocean predators, orcas may not occupy a place directly above the sharks so much as off to one side. So-called “lateral interactions” between top predators are fairly well understood on land, Sal says — but are much harder to document in the ocean. Because these interactions are so rare, fully understanding this apex predator relationship will take time. Doing so will help us better protect the vital intricacies of our global ocean. Learn more about white shark research at the Monterey Bay Aquarium. See original article with video . . .